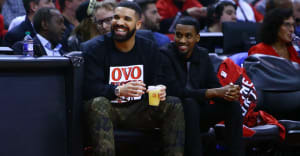 Drake's new album Scorpion is closer than ever, and though details are still scarce on the potential double record, Champagne Papi has been upping the ante on the album teases lately. Tonight, he unveiled the trailer for the album, which you can watch above. It's soundtracked by "The Mark - Interlude," the opening cut from Moderat's 2013 LP II. Get your scorpion emojis in line for this Friday, when the album finally drops.